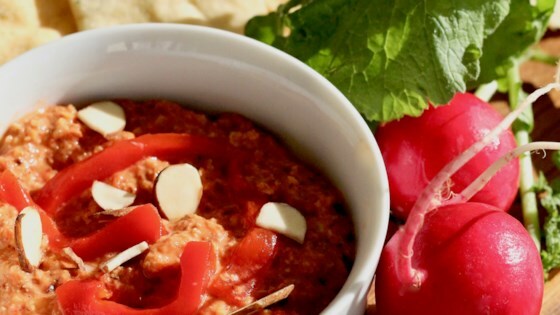 "This versatile dip adds zesty flavor to any food it's served with. Top with additional sliced almonds and diced roasted red peppers, if desired. Serve with pita wedges, crackers, or crudites." Heat a skillet over medium heat; cook and stir almonds until toasted and fragrant, 2 to 4 minutes. Combine toasted almonds and mayonnaise in a food processor; process until finely chopped. Add roasted red peppers, Parmesan cheese, balsamic vinegar, garlic, salt, and pepper; process until desired consistency is reached, scraping down the sides as needed. Chef John's version of the most delicious Syrian food you need to be eating now. Nutritional yeast can be used in place of the Parmesan cheese, if desired.